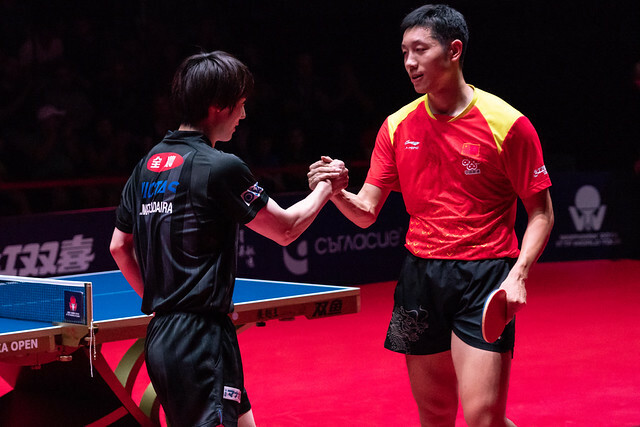 Players of the highest pedigree; on duty for China at the Rio 2016 Olympic Games and at all recent World Championships, Xu Xin and Ding Ning reserved their places in the respective Men’s Singles and Women’s Singles finals at the 2018 ITTF World Tour Asarel Bulgaria Open in Panagyurishte, following success on Saturday 18th August. Furthermore, neither was severely tested, neither in imminent danger of defeat. At the quarter-final stage of the Men’s Singles event Xu Xin, the no.2 seed accounted for Japan’s Koki Niwa, the no.5 seed (11-1, 11-6, 11-9, 11-7) and thus avenged the loss he had suffered when the pair had met in the Chinese city of Wuxi at the Seamaster 2017 Asian Championships. Success in straight games, it was exactly the same in the penultimate against the defensive style of colleague Ma Te, a players whose journey had started in the qualification tournament. Xu Xin showed no mercy, he prevailed in four straight games (11-9, 11-8, 11-2, 11-8). Notably, one round earlier, Tomokazu Harimoto had overcome Vladimir Samsonov of Belarus, the no.10 seed (11-4, 11-8, 9-11, 3-11, 11-6, 11-5). Impressive from Xu Xin, it was also most imposing from Ding Ning. The no.6 seed, she accounted for Japan’s Kasumi Ishikawa, the top seed and defending champion (8-11, 12-10, 7-11, 11-4, 11-8, 11-4), prior to overcoming colleague and qualifier, Liu Gaoyang (11-8, 11-4, 10-12, 12-10, 11-4). Defeat for Liu Gaoyang but she could hold her head high; at the quarter-final stage she had beaten Japan’s Miu Hirano, the no.3 seed (11-8, 11-9, 2-11, 11-7, 11-4). The end of the road for one qualifier, for another it was success; in the counterpart semi-final contest, Wang Yidi, also from China had overcome the defensive skills of Japan’s Hitomi Sato, the no.4 seed. She prevailed in six games (7-11, 9-11, 11-7, 11-4, 12-10, 11-6). Finals of all events will be played on Sunday 19th August.